Helping your baby achieve a deep sleep is the key to a successful newborn photography session. 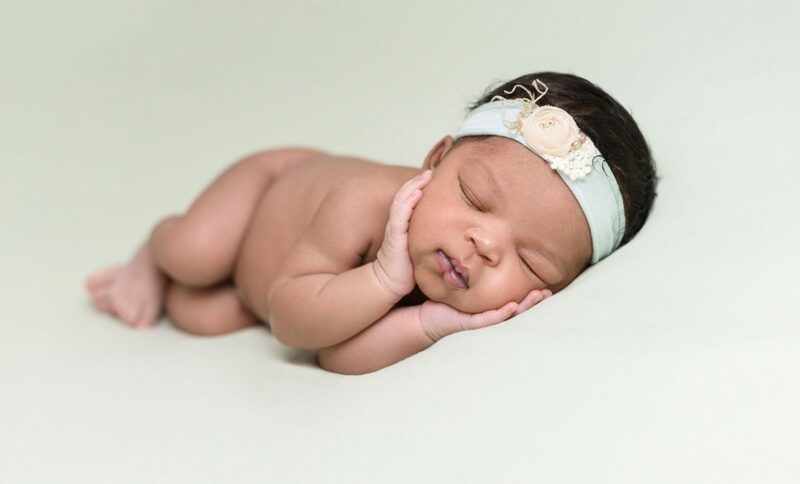 As I mentioned in my post: “How to prepare for your newborn’s baby photo session”, most newborn photography poses require that your baby be in a deep and relaxing sleep. Oftentimes, more of a newborn session is actually spent helping the baby achieve a super-sleepy state, and posing them, than actually taking photographs. An experienced, trained and professional newborn photographer will have lots of tricks up their sleeve to help your baby achieve a deep sleep. Some of these are quite practical, like setting the room to a temperature that is comfortable for your baby. At Truly Madly Deeply, we follow the Guidelines for Perinatal Care, by the American Academy of Pediatrics’ (AAP) and the American College of Obstetricians and Gynecologists’ (ACOG), and set the room temperature between 72-78°F (22–26°C). Your professional newborn photographer will also likely call on their years of experience, handling hundreds of newborns, to find the right techniques to help make your baby comfortable and sleepy. … create a plan with your newborn photographer for pre-session and mid-session feedings. This is where you can have the biggest influence on outcome of your newborn photography session. It’s simple enough to ensure your baby is full (and therefore nice and sleepy) at the start of the session. Simply feed your little one before you arrive at the studio. Actually, I recommend to my clients that they arrive at the studio about 15-30 minutes before the schedule session time, and feed their baby in the comfort and privacy of the studio before the session begins. Responding to your hungry baby throughout the session, however, presents a couple of options. The option you choose may have a big impact on the success of the shoot. Option 1 – Nursing: When your baby gets hungry during the session, the photographer can take a break from shooting so you can nurse your little one. This option can be a little more disruptive because it will require the photographer to reposition your baby after the feeding and encourage your baby back into a deep sleep. Option 2 – Bottle-feeding: When your baby gets hungry during the session, you or your photographer can give the baby a quick, mid-session “top-up” from a bottle of pre-pumped milk. This can be done while your little one is still in the posing position. This option creates minimal disruption for your baby and to the flow of your baby’s photo session. Option 2 allows more time for your photographer to work on more poses. This will ultimately result in more variety in your newborn photographs. Of course, if you prefer to breastfeed during the session, rather than use a bottle, your photographer will be more than happy to accommodate you. It would be a good idea, however, to let your photographer know in advance so they can plan accordingly. Arrive with a well-fed baby. Alternatively, arrange with your photographer to arrive early so you can feed your baby at the studio before the newborn photography session begins. Bring bottles of pre-pumped milk (or formula) to allow your baby to feed in position whenever s/he is hungry. This will possibly allow them to return more quickly to a restful sleep. If bottle feeding is not an option for you, advise your photographer in advance. This will allow them to adjust the session plan to accommodate mid-session nursing. Are you interested in booking Truly Madly Deeply for portrait, maternity or newborn photographs? Give us a call at the studio on (912) 642-8000, or complete the form below or on the Contact page to send us a message. Have a question or want to help others by sharing your newborn portrait experience? Please leave a comment below. Before you go...did you enter to win a portrait session?